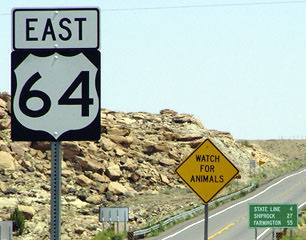 Today US 64 continues ahead (curving to the right), but originally it ended there. 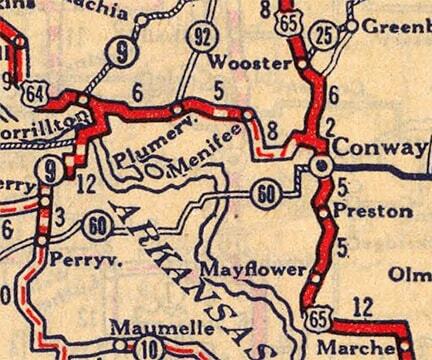 AR 25 was the original alignment of US 65, so northbound was originally to the left, and straight ahead was southbound US 65 heading towards downtown Conway. In 1951 a ferry was established at Sandy Point (to the south of Ft. Landing, across the Little Alligator River, where US 64 runs today). The ferry went across the Alligator to East Lake. The US 64 designation was extended east via this ferry, and then on to its current terminus at the Atlantic Ocean. 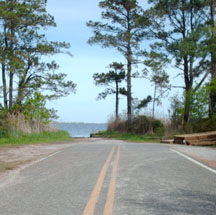 This occurs at a place known as Whalebone Junction, on the Outer Banks (photos and more info on the Nags Head page). 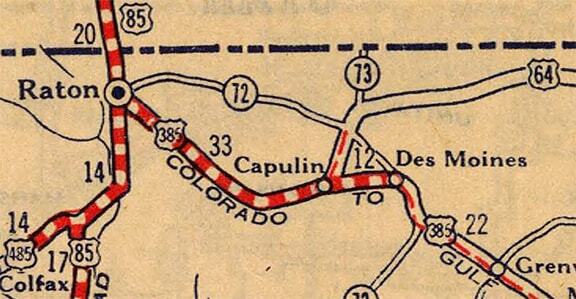 For a couple years, US 64 was overlapped west from Capulin with US 385, where those two routes shared a common terminus in Raton. 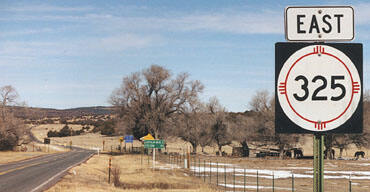 Then, for the next several years, the west end of US 64 was in a city it no longer even serves: Santa Fe. 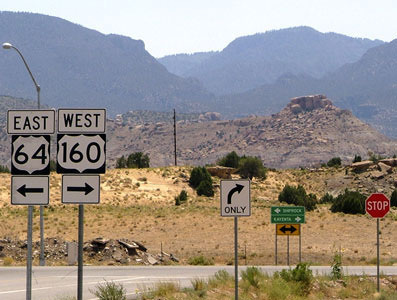 At Taos, instead of heading up to Tres Piedras, US 64 was routed down modern NM 68, to its junction with US 84-285 near Espanola. South from there, it overlapped with those two highways down to Santa Fe. 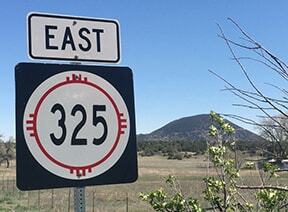 That changed in 1974, when a new road allowed travelers to get from Tres Piedras over to US 84 at Tierra Amarilla. 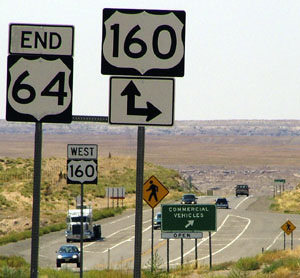 Then US 64 was truncated at Taos, and instead changed to its modern route to Farmington (its path from Chama through Dulce and Bloomfield was previously designated NM 17). The first item on the mileage sign says "State Line: 4". It seems odd when boundaries are used as control points: is there anyone for whom the state line is actually their destination? This is a situation that cries out for renumbering. 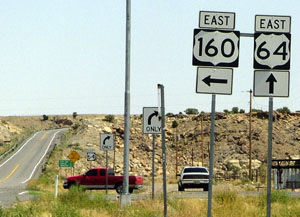 AZDoT should get AASHTO's approval to change the designations such that -- instead of US 64 ending at this junction -- it would be US 160 that ends here, and US 64 would continue ahead (read more here).